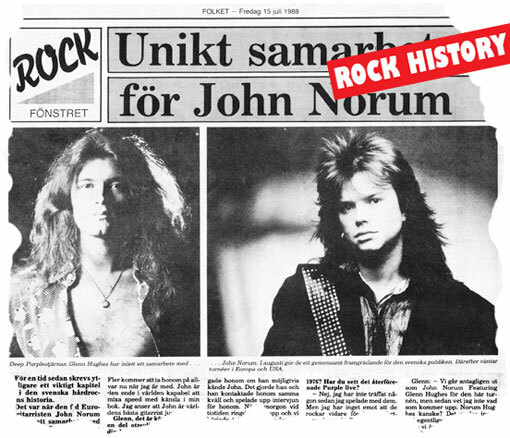 The last weekend of June 1988 was a good one for me because it was then that I met my idol Glenn Hughes for the first time for an interview in Stockholm (at a place called Fryshuset, in which he was rehearsing with John Norum and his band at the time). It was early days for this collaboration and the situation at the time was that John Norum had a tour to do and this was set to start in August. The fact that Glenn Hughes had joined forces with John would probably have meant that a new band name would have been in the cards later on but at the time of my chat with John and Glenn for Metal Hammer (in Germany) they had not resolved this issue. I did not take any pictures that day, I can´t remember now if I wasn´t meant to or if I simply had no camera with me. My guess is that they wanted a professional photoshoot for that for the media. I don´t know how many interviews they did during these few weeks, but soon after this meeting Glenn was asked to leave and the project fell through. John drafted in singer Göran Edman and it was him that could be seen in the German Metal Hammer article (with this interview!) that summer – slightly sad I guess. Eventually, Glenn did sing on John Norum´s “Face The Truth” record in 1992, so they did close this aborted project with some grace a few years later. My impression of Glenn at the time was that he was in bad shape. I was very happy to meet him, but it was a star fallen from grace that I had in front of me that day. Not that it mattered, I was only too happy to support this new band and I wanted them to succeed. The fact that it blew up soon after this meeting made it a little bit special – I got a glimpse of something that few got to see. This translation is picked from a Swedish newspaper called Folket (printed on July 15 1988). I reprinted this in RETROFUTURE 5 last year. Enjoy! John, I understand that you have followed Glenn´s career closely through the years, is that correct? John / – Yes, I guess I was about twelve when I first heard Deep Purple´s “Burn” and then I bought “Stormbringer” and “Come Taste The Band”, the Trapeze albums and his solo record “Play Me Out”. I always thought that Glenn was the best singer in Deep Purple, that he was better than David Coverdale. It must be a little strange to get to work with an old idol? John / – Yes, it certainly is, but it is a wonderful thing. Glenn is a bit funky and that suits the band just fine. Glenn / – It can only be a matter of time before the world realise just how good John is. I know that he is big here in Sweden already, but I am talking about the world. More people will take him seriously now that I am working with him. John is the only guitarplayer today that can mix speed with emotion. He is the best guitarist in the world right now. Glenn, it is a well known fact that you have seen some bad things during your career, is the prospect of a six month tour a frightening thought? Glenn / – No, because in this band we are friends. It is also the first drug free band that I have ever worked with. For once I don´t have to be surrounded by people that take drugs. It is nice to not have to be part of that scene. I left Los Angeles for Atlanda for that very reason, I felt I needed the change. I stopped doing drugs five years ago for the simple reason that I want to live. Me and my girlfriend live on a ranch outside the city and we have some animals there. It is a good life. Is it true that you were going to form a band with Tommy Bolin? Glenn / – Yes, we had talked about it. He was my best friend and we talked about doing something when he had finished touring for “Private Eyes”. It never happened. I was at his funeral and it was a terrible thing. So how did you hook up with John Norum? Glenn / – When John left Europe I heard from fan club people in England that he liked me. I knew who he was because I had heard “The Final Countdown” and his playing on that was impressive. In September last year, I did an interview with Anders Tengner and I asked him if he knew John. He did, so he contacted him that same night and played the interview for him. Next morning around ten he called me up and we started to talk on a daily basis. You should have seen the phone bills! Eventually, he asked me to come over and see him play at Hammersmith Odeon in March. Which songs from Glenn´s past are you going to perform live? John / – We have rehearsed Purple´s “Lay Down Stay Down” and I would really love to do “Burn” as well. Gary Moore´s “Reach For The Sky”, naturally. Hughes Thrall´s “I Got Your Number”. I personally think that Pat Thrall is the best guitarist that Glenn has ever worked with in the past. “Coast To Coast” is another favourite. Plus, we will play my “Total Control” album. It is that record that I need to promote right now. We will not record a new record until next summer. Glenn / – No, but I am looking all the time (laughs). I do read about it and of other phenomena, it interests me. Ritchie Blackmore had strange seances going on when Deep Purple recorded in Clearwell Castle, but it was too scary for me. Things would be flying around in the air. I think it is wise to stay clear of things that you don´t know too much about. Even Ritchie could get freaked out, but then he scares easily. I do admire him, he is one of the great personalities in rock. Have you met anybody from Deep Purple since the split in 1976? Glenn / – Not really. But I don´t mind them carrying on because I am still part of the Purple organisation so I am still making money from those days. “Burn” is selling really well on CD right now. Is it a bit strange to move to Sweden for this project now? Glenn / – No, but everybody assumes that it is. To me it is just another step in my career and you go where the work is. I have already made some friends in Stockholm. What is the name of this band really? Glenn / – We will probably go out as John Norum featuring Glenn Hughes on this tour, after that I don´t know. Norum Hughes maybe? It doesn´t really matter as long as people know who we are. Me and John are going to sell the albums. Kind of reminds you of the Mick Jagger and Keith Richards situation, uh (laughs)?